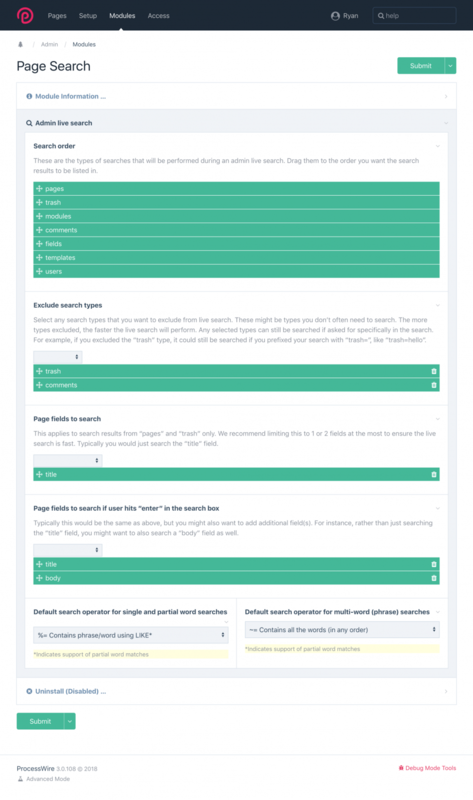 Continuing from last week's post, ProcessWire 3.0.108 is now available on the dev branch, and it adds support for a new, more powerful live search in the admin. This week we will take a closer look at how it works, as well as how module developers can make their modules searchable too. If you haven't yet read last week's post, I recommend reading that first, as this post is a continuation of that post. The little search box in our admin themes has gained a whole lot of power. As always, you can just start typing something, and it'll start finding matching pages. The biggest differences now are that any module can implement the SearchableModule interface, and then make its items available in the search. In addition, the search box now lets you specify a single selector, for the times when you want to focus your search on a specific type of items, or on matching a particular property or field within those items. This opens up a whole lot of new options. Notice that first group of items, where it says to "click here" to configure the search settings. If we click that, it takes us to the ProcessPageSearch module configuration. This is where we can fine tune what order the search results are displayed in, what types should be excluded, what fields are searched on pages (if no field specified in the search) and what default operators are used. Last week's post went into several examples of searches, which we won't do again in this week's post. However one shortcut has been added that I wanted to mention. You can now perform "field=value" searches on pages, which is a shortcut for "pages.field=value". For example, "body=ProcessWire" would find all pages having a "body" field that contains the term "ProcessWire". You can also perform "type=value" (like "comments=test"), and "template=value" (like "basic-page=test") searches. As a result, the "field=value" search can only be used if the field name you need to search doesn't collide with an existing type or template. Chances are it won't. But if it does, then you'd want to use longer "pages.field=value" instead. By adding that "searchable" property to the getModuleInfo(), ProcessWire knows to load your module and call a search() method from it, whenever an admin search is performed. Your module does not need to be auto-load, and no hooks are involved in the process. That's all there is to it when it comes to the basics. All that's left to do is to test it out. However, ProcessWire might not yet know that your module is searchable. In order for it to find out, you'll have to do a Modules > Refresh. Once you've done that, ProcessWire will know about it. To test out your search, start typing something that you know will match one or more of your widgets, like "test". They should appear in the drop-down search results under the "Widgets" heading. Notice that it also matches any other (non-widget) data types that contain the term you searched for (including pages, fields, templates, modules, etc.). If you want to limit your search to just widgets, then type "widgets=text", and it will only call your widgets search() method. This is just a simple example, but if you are interested in implementing a search feature in your module, I'd encourage you to look closely at the SearchableModule interface, which explains all of the options and details. The purpose of this SearchableModule interface is purely for documentation purposes, so it's not necessary for your module to have an "implements SearchableModule" in its class definition, unless you want to. That's because ProcessWire instead uses the "searchable" module info property to determine if the module is searchable, since it is more efficient in our context. 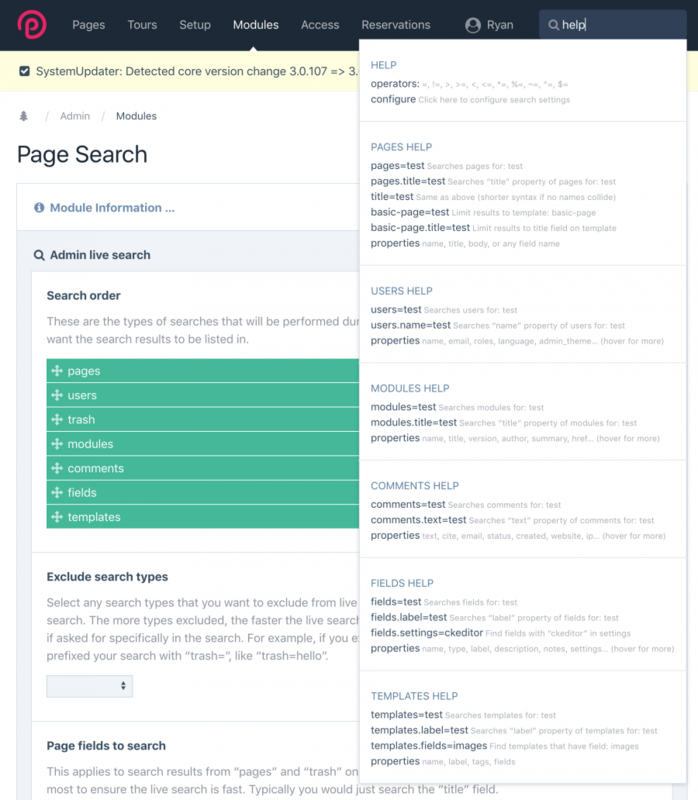 But it is a good idea to read all the documentation in the SearchableModule interface, because there's a lot more you can do when it comes to implementating a search. Examples of more complete search() methods can also be found in ProcessTemplate, ProcessField, ProcessPageType, and ProcessCommentsManager. Thanks for reading, and I hope that you have a great weekend. Check in at the ProcessWire Weekly this weekend for the latest ProcessWire news.